Poverty has been studied across many social science disciplines, resulting in a large body of literature. Scholars of poverty research have long recognized that the poor are not uniformly distributed across space. Understanding the spatial aspect of poverty is important because it helps us understand place-based structural inequalities. There are many spatial regression models, but there is a learning curve to learn and apply them to poverty research. 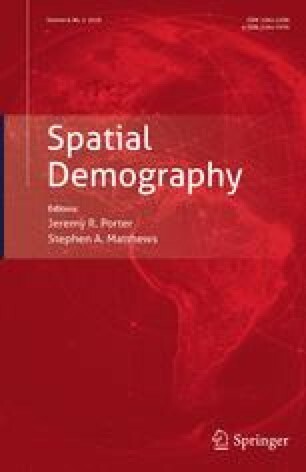 This manuscript aims to introduce the concepts of spatial regression modeling and walk the reader through the steps of conducting poverty research using R: standard exploratory data analysis, standard linear regression, neighborhood structure and spatial weight matrix, exploratory spatial data analysis, and spatial linear regression. We also discuss the spatial heterogeneity and spatial panel aspects of poverty. We provide code for data analysis in the R environment and readers can modify it for their own data analyses. We also present results in their raw format to help readers become familiar with the R environment. This research was supported in part by the National Science Foundation (Awards # CMMI-1541136, # OPP-1745369, # SES-1823633, and # DGE-1806874), the National Aeronautics and Space Administration (Award # NNX15AP81G), the Eunice Kennedy Shriver National Institute of Child Health and Human Development (Award # P2C HD041025), the National Institute on Alcohol Abuse and Alcoholism (Award # U24 AA027684-01), and the Social Science Research Institute, Population Research Institute, and the Institutes for Energy and the Environment of the Pennsylvania State University. Fox, J., Weisberg, S. (2011). An R companion to applied regression, 2nd edn. Thousand Oaks CA: Sage. http://socserv.socsci.mcmaster.ca/jfox/Books/Companion. Pebesma, E., Bivand, R., Rowlingson, B., Gomez-Rubio, V., Hijmans, R., Sumner, M., et al. (2018). Package ‘sp’. R package version 1.3-1. https://cran.r-project.org/web/packages/sp/sp.pdf. Walker, K. (2018). Tigris: Load census TIGER/Line Shapefiles. R package version 0.7. https://CRAN.R-project.org/package=tigris. Wickham, W., Hester, J., François, R. (2018a). readr: Read Rectangular Text Data. R package version 1.3.1. https://CRAN.R-project.org/package=readr. Wickham, H., François, R., Henry, L., Müller, K. (2018b). dplyr: A Grammar of Data Manipulation. R package version 0.7.8. https://CRAN.R-project.org/package=dpylr.